Small business owners have a lot of responsibility when it comes to calculating employment taxes. There’s not only several different taxes that need to reach multiple government agencies, but any error can result in stiff penalties from the IRS. In this guide, we’ll show you how to use a free payroll calculator to make this task easier. We’ll also explain how Gusto payroll software can be used to calculate and pay employment taxes automatically – so you don’t even have to worry about using a payroll calculator or filling out IRS forms. Try it free for a month! 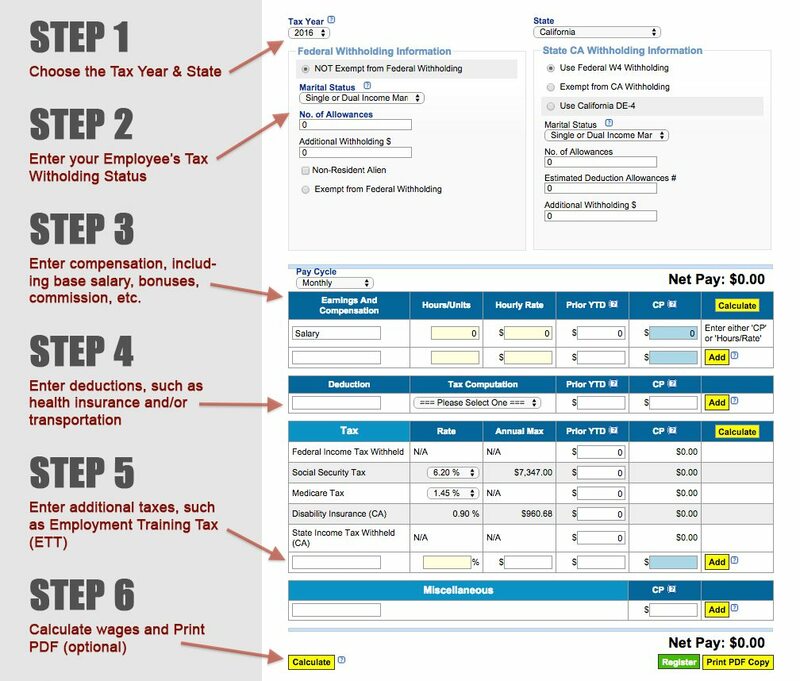 To calculate wages and employment taxes, we recommend using this free payroll calculator from eSmart Paycheck. You can run it for one employee at a time. Along with their salary/compensation, you’ll have to enter their tax withholding information, including their marital status and number of allowances. SUTA and FUTA are state and federal unemployment insurance taxes. SUTA tax rates are assigned individually to each business. You should get your rate each year in the mail, or be able to login to your state tax website to find it. Factors that affect your SUTA rate include your industry, number of years in business and whether or not any former employees have received unemployment benefits. The FUTA tax rate is a flat 6% on the first $7,000 of earnings per employee. In practice, however, this tends to be much lower (0.6%) since most businesses earn a FUTA reduction. For more on FUTA & Form 940, check out our full guide here. Employer social security & medicare taxes are simple: They’re the exact same as the amount you deduct from your employee. In other words, both you and your employee pay an equal share of social security and medicare taxes. So whatever amount you deducted from your employee, you’ll also have to pay yourself. For 2016, the social security tax rate is 6.2% (for both the employee and employer – or 12.4% total) and 1.45% for Medicare. The social security tax has a wage base limit of $118,500, which means you do not have to pay additional social security taxes if you earn above $118,500. The most an employee or employer would have to pay is $7,347 (or $118.500 * 0.067). Medicare does not have a wage base limit. While this is not actually a tax, it is something employers need to pay for to stay compliant with the law. With the exception of Texas, most states require you to purchase workers comp insurance as soon as you hire your first employee. This can typically be purchased through the state or a private carrier. To find your state’s specific policy, check out this table from the National Federation of Independent Businesses (NFIB). As you can probably sense at this point, running payroll can get complicated. Between all the state and federal taxes you need to pay – both on behalf of your employee and on behalf of your business – there’s a lot of room for error. Any mistake, however, can be a costly error. In 2014 alone, the IRS issued over 6.9 million penalties related to employment taxes. This totaled nearly $5 billion in fines, according to the 2014 IRS Data Book. The issue is not only miscalculations: Small businesses can also fault from missing deadlines, using incorrect rates, sending forms to the wrong agency, or simply filling out forms incorrectly. Things get especially complicated when federal and state requirements overlap, like in the case of unemployment insurance. For example, only after you’ve filed SUTA taxes (correctly and on time) can you apply the discount to your FUTA taxes. With recent updates, you can also now purchase workers comp insurance and health insurance, or setup benefits like transportation and retirement funds. As with payroll taxes, Gusto automatically submits forms, calculates insurance payments and sends them on your behalf.